Garnish with lemon slices or sprinkle with fresh chopped parsley. Make your food look pretty and appetizing. In a food processor/chopper or blender place 2 garlic cloves, 1/2 cup parsley leaves, 1/4 cup mint leaves, and 1/2 tsp. salt in a food processor until smooth, stopping to scrape down sides as needed. With processor running, pour oil through food chute in a slow, steady stream, processing until smooth. Smash remaining 6 garlic cloves, using flat side of a knife. Pour water to a depth of 2 1/2 inches into a large skillet over medium-high heat. Add smashed garlic, 1/2 bunch fresh parsley, and lemon slices; bring to a boil. Add salmon fillets; return liquid to a boil, reduce heat to low, and simmer 7 to 10 minutes or until fish flakes with a fork. 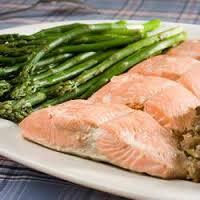 Remove salmon from skillet; discard liquid in skillet. Serve salmon with garlic-parsley mixture on the side. Garnish with lemon slices. Serve with a side of asparagus, or steamed artichokes, maybe your own favorite slaw recipe.